Consider this scenario. The economy, after being buffeted by the Global Financial Crisis, is finally showing signs of a strong recovery. The opposition Labour Party is led by a slightly goofy, not-very-charismatic guy who says he’s intent on making a break with the neo-liberal orthodoxy and wants to return Labour to its traditional concerns with social justice. Problem : this leader is not the greatest public speaker and often seems as if he’s lecturing and patronising his audience, rather than making an emotional connection with them. Yet despite all these limitations, he’s on track to win the next election! That last point should be a clue that I’m actually talking about Ed Milliband, the Labour Party leader in Britain, and not about David Cunliffe in New Zealand. But here’s another parallel reality, this time about polls closer to home. At the same point in the electoral cycle in 2005, when the Clark government was seeking its third term in office (just as John Key is this year ) the polling situation was looking remarkably similar for the incumbent. In mid March 2005, the combined centre-left vote was registering 51% in the One News Colmar Brunton poll, while National (under the leadership of the quintessentially goofy-at-times Don Brash) was languishing at 35%. Yet eventually, the 2005 election proved to be a very, very tight contest. What all this suggests is that it is entirely possible for David Cunliffe to survive his current, largely self-inflicted problems. The great thing about self-inflicted problems is that once you stop hammering your head against the concrete, things suddenly feel a whole better – and you haven’t actually hurt anyone else, much as you may have alarmed them. 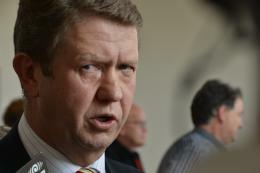 Whether Cunliffe can still come back from the brink is anyone’s guess. In many ways, he is an unknown quantity to the Labour faithful, let alone to the wider public. On March 10, Werewolf editor Gordon Campbell interviewed Cunliffe about some of his current problems, and about a few of the solutions he has in mind. Campbell : If you can‘t organise yourself and your office properly, why should anyone trust you to run the country ? Isn’t that a reasonable conclusion for the voters to have reached, given the events of the past few weeks ? 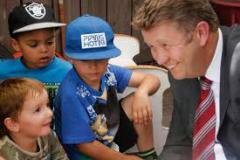 Cunliffe : No, it’s not. It’s not our fault that our chief of staff got a serious illness, and we’ve been without a chief of staff since mid-December, putting extra pressure on our office. Secondly, we faced a situation where the government couldn’t argue with the substance of our Best Start package for children so they decided to argue with some of the words in the speech. Admittedly, there was a word [in the speech] that should have been a ‘can’ rather than a ‘will’, but our supporting materials were very clear. So, it was overblown. Even so, knowing how Labour had railed against the use of trusts for laundering political donations, how on earth could you have (a) considered the use of trusts at all and (b) needed legal advice about whether to disclose one of them ? The residue is that it has left a question mark over your core values and your political instincts. Well, I have six months to prove my core values to the rest of New Zealand, and I’ve got about 40 minutes to prove them to you. Unlike many other Western democracies we don’t have state funding for political parties, beyond the small allocation for the broadcasting of election messages. In your opinion, does that leave our politics that much more vulnerable to wealthy donors and their agendas? Well, I’ve always supported very strict campaign finance limits. I’m very pleased that in local campaigns we have very, very strict limits by world standards. I would support tightening the limits nationwide, for all parties. It cannot be that politics is the preserve of the independently wealthy – that would play into the hands of the privileged. Nor can it be the case that money buys votes, right? And it was to prevent any inference of that, that we set up an anonymous trust so that I would not know who the donors to my primary campaign were. Except that you knew who to call, when you wanted to disclose them. I did not. I knew to call the trustee. The trustee called the donors. I didn’t. I did not know who the donors were. We’ve now got an election date. Currently, is Labour the underdog as we head towards that election ? Actually, [it is] reasonably balanced between right and left. Polls have been bouncing around a little bit the last couple of weeks, but most polls since I took over as leader have shown it very finely balanced between the right bloc and the left bloc. The election is absolutely anybody’s to win. There is no way it is a foregone conclusion. And we are in it to win it. Right. But the government is able to point to New Zealand having 4-5% economic growth in prospect this year. Isn’t it a bit churlish to intimate that this is solely due to the 20 year high in dairy prices and the insurance cheques for the Christchurch rebuild? It is very heavily due to those two factors. And a little bit of a cyclical rebound from the GFC [Global Financial Crisis] But that has been a very long time coming and we’ve bounced off the bottom of the Treasury’s projections for at least the last three years. Actually, it’s a pretty sorry story. And what is clear is that the government does not have a plan to fix the structural problems that are leading to the hollowing out of the New Zealand economy. And that is our principal economic task. Even so, nearly two thirds of the public are telling pollsters they think the country is on the right track. Isn’t this a bad time to be the guy on the street corner with the sign saying The End is Nigh? Not when you’re offering an alternative programme that will create more opportunities for all New Zealanders. That will speak directly to the needs of all New Zealanders at the bottom of the stack. And also to the needs of those hard-pressed families in the middle. We are deadly serious that we can make a positive difference…. That’s difficult isn’t it – [given that] you seem to be running against Key on the basis of what the government isn’t doing and should be doing, rather than on what it has done. [That’s] Because I think at the end of the day, hope is better than fear. And positivity is better than negativity. I can give you a long list of things that the government has done that I don’t like. I absolutely abhor their short-sighted asset sales programme. I absolutely do not agree with tax cuts that were slanted to the top end. I do not agree with their hypocrisy around superannuation, or the absence of a capital gains tax. Now… the government has absolutely got to take some more courageous long term decisions. Supposedly those asset sales you mention are wildly unpopular with the majority of voters. So how come Labour hasn’t reaped a bigger political dividend from them? What we know from the 2011 election is that running a campaign solely against asset sales gets you so far, but no further. Now, we got 660,000 votes last time around, roughly speaking. We are aiming for a million votes this time around. We’ve closed some of that gap. We have a very good idea where we are going to find the balance. OK. But on the current polling, do you expect that you will need Mr Peters to form a government ? That is a matter for voters. On the current polling [what’s the answer] ? On the current polling, it would be more likely than not that an alternative government would include the Greens and Mr Peters. It would need to be carefully put together to satisfy the core needs of all those three parties. However, today’s polling is not a fair indication of where we will be on election day. Key is already saying that Peters is a natural ally for Labour and the Greens. Is there a risk that Labour will reap all of the downsides of being associated with Peters before the election, and National will gain all the upsides, after the election? Well, I’m afraid I’m just going to be very plain speaking about it. I’ve always said that we have a respectful relationship with Mr Peters. He’s a very experienced politician and able Minister in the Clark government. I do not agree with all of his views. I would definitely want to see a different kind of multi-cultural community flourish. But at the end of the day, we will be guided by the decisions of the voters and we will make that coalition work. Won’t he always be able to get more from National than he could as the third wheel in a Labour/Greens government? If the sticking point on getting Peters on board and forming a government came down solely to the retirement age, would that issue, for you, become negotiable ? I’m going to do something novel and negotiate the coalition agreements after the election. And I’ll probably do it in private, rather than through the august organisation that you represent. Yet over a very long time there’s been this sense that both major parties regard Mr Peters fairly or otherwise, as a form of political Kool-Aid that they wish the other side to drink. How can Labour ensure that National drinks its share, pre-election ? Labour is going to campaign on the issues that we believe New Zealanders care about, and that are key to our values. It is my job to maximise the Labour vote, and it my job after the election, to put together a winning coalition. Now, I’m not going tto be running down Mr Peters and I’m not going to be running down the Greens. I will be running down the National goverment, because they patently deserve it. Presumably, the details of your alternative economic policy will be released closer to the election. Yet in your opinion does the current economic orthodoxy – which is based on a fairly heroic faith in maximally free markets, de-regulation, minimal taxes on the wealthy and trickle-down economics – still have much mileage left in it ? In your opinion, was trickle-down economics primarily a failure because (a) it was morally wrong, or because (b) it didn’t work ? It’s actually both. It is morally wrong because it values people as commodities and does not deal justly with people of variable abilities and circumstances. It is morally wrong because it does not deal justly with people who through no fault of their own, are born into poverty, or into less opportunity. It is also practically wrong ; because it just doesn’t grow the pie for everybody as well as it might be grown. Especially in a small economy at the bottom end of the world, where we cannot bet on all the horses at the same time. We need a strategic plan for growth, for adding value, and sharing it. So that all our kids can prosper, and not just the kids of the wealthy. Right. So this becomes a common problem, one facing both parties : how to create an economy marked by higher skills, higher productivity and higher wages. On a scale of one to ten, how would you rate the government’s progress in creating a plan to that effect ? A three. Seriously. What I’m hearing from the business community that we are very much engaging with at the moment, is that, charitably, yes, [the government] helped us muddle through the GFC and it could have been worse. But they really don’t have a plan to take the country forward. It certainly isn’t in the glossy brochures they call the Business Growth Agenda, which is a vacuous collection of micro-initiatives that people were doing anyway. Are the main wealth creators the people with the most wealth? No. Wealth creators are every New Zealander that works and does their best. They are every New Zeakand inventor or creator. Or producer, or farmer, or worker. We are all in the waka together. We are selling ourselves short because we are not investing in a rich, innovative eco-system, a decent skills strategy – we are beggars and borrowers from foreign capital, and we do not have an adequate savings record, or an unbiased tax system. All of those things add up to an impoverishment in the long run, and a Labour government will fix them. That was certainly true during the Clark years. It was a stronger lead than under the Bolger years, is my advice. Yet in the 2011 election – and this is according to the research done up at Victoria University by Hilde Coffe – that gap has vanished. What is your current polling telling you about where Labour – and you personally – stand with women voters? Marginally ahead, but not as far ahead as the Clark government. That’s the honest answer. Is there any breakdown of that? I don’t have it, but I’m willing to come back to you with that. John Key has always been more popular than the policies of his government. 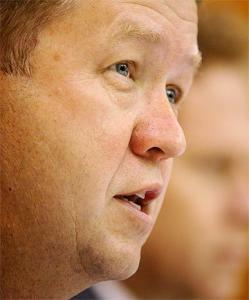 Has Labour finally learned the lesson that personal attacks on Key’s wealth tend to backfire ? And that’s partly because having and enjoying wealth is something to which most people aspire, right ? Correct. And its something I make no apology for, having grown up in pretty modest circumstances, the son of a rural vicar, and coming from a family that didn’t have two bucks left, at the end of the week. But I grew up in a country where a good state school system gave me opportunities, as did my wife. And we did well… BUT, I feel a sense of responsibility to make sure the next generation does even better and I sure as heck don’t want to see the ladder of hope being pulled up on people. And the same Prime Minister who grew up in a state house – and this is not a personal attack – just happenerd to cancel 500 state houses in Hobsonville, in his electorate. OK, you’ve been Leader of the Opposition for nearly six months. From the outside, the job requires you to look like an attractive and credible alternative to voters, for a very long period while you have no ability to deliver them relief, or satisfaction. It looks like a very nebulous kind of job. Is it? – and that is why a whole lot of vested interests bear down upon the Opposition, and in particular in the Leader of the Opposition. Luckily, I can take it. Do you think it’s possible for Labour to lose the battle among the commentariat and still win the election – via the mobilisation efforts made before, and on, election day ? Yes it is. But I wouldn’t rely solely on that. If we were to get one quarter of the 816,000 enrolled non-vote – who are Labour leaning out to the vote, then we would win the election. Therefore, and given his grassroots campaigning skills, wouldn’t it have made more sense to make Matt McCarten your campaign manager, rather than your chief of staff ? You haven’t met Dave Talbot, who is a wonderful campaign manager. Well, maybe you have. I’m very happy with the choice of Matt McCarten as chief of staff ; he’s a campaigning chief of staff who is filling in here at the start of an election campaign. You are sitting here in what used to be endearingly called the leader’s lounge. There’s no lounging going on. On the wall you’re seeing charts for every organising hub in the country. [Cunliffe walks around the room and flicks open a panel concealing a white board festooned with hieroglyphics about “Christchurch” and various other headings and sub-headings, before he just as quickly closes it. Clearly, this glimpse into the tabernacle of Labour election strategy is meant to impress ] You’re seeing strategic battle plans being developed. I won’t dwell on it but you know, it’s all go. And Matt McCarten is both a person who can work closely with people and earn their confidence, and is a hell of a campaigner. If appointing Matt McCarten is high risk, it’s a high return project. My question wasn’t whether he should be on the team – but where he should be on the team. What I wanted was a top political strategist to unify the strands of advice in my broader office. And to provide a clear guiding hand, with lots of experience, in terms of a working interface between my office and caucus. That’s the problem isn’t it ? Labour keeps on putting out policy like Kiwi Assure and the Head Start policy, as if that were enough. Obviously. But there’s a sense that when the inevitable counter-attack comes, Labour clearly hasn’t anticipated it, and is caught in the headlights. Why has that been happening ? We are moving to a rapid response system where we will repel every argument that we think worth repelling within a fixed and very rapid timeline. And we are re-tooling the systems, that will allow us to do that. Fast and accurate. Fine. But up until now and before policy has been released, have you and your team rehearsed the likely lines of attack, and devised responses ? Yes of course we have. Because it hasn’t looked like it. Well, it may not. But yes, we have. Can we still improve? Yes, of course we can. OK, you’ve talked about Labour’s engagement with the business community – and sure, no one is demonising the business sector and engagement with it is essential to generate wealth. But in the UK, Labour has talked a lot about the social impact of what Ed Milliband calls ‘predatory capitalism.’ Meaning : some parts of the modern corporate world now prey on the community, rather than contribute to it as they might have done in the past. Do you see any signs of where predatory capitalism is of concern in this country? Paraphrased, does that amount to saying that governments sometimes need to intervene in markets, in order to save capitalism from itself ? So, your second part ? The second part is that capitalism – or the neo-liberal version of it – can be inherently short term. That’s nobody’s fault, it’s just the way it is. Thsee days with the pressures of the market, particularly in publicly listed companies… boards of directors are putting pressure on management teams to build on their quarterly results. The job of a government is to look over the horizon and ask what kind of country do we want to be, in ten or twenty years time? Amd having got some clarity through conversations with the community about what the vision for the good is, hopefully it will be something with a healthy dose of social justice. And for a country like New Zealand, with plenty of smarts so that we can maximise value. Right. And to bring that down to earth, take an example. Some people would point to the banks, and to their annual profits, as a case of predatory capitalism. Will Labour be putting more money into Kiwibank so that it can act as a stronger competitive brake on the excesses of the Aussie-owned banks ? Well, two things: the rate of incomne income inequality was very high by the end of the 1990s. It took a while to turn it around. The Clark/Cullen government did start to turn it around and it started to drop – and then the GFC hit, and it was all over the place in the crisis years that followed. And it has remained volatile, but at high levels. The problem with that picture is that when income inequality is stuck at high levels, wealth inequality continues to polarise. The gap between the haves and the have-nots is wide and getting wider. One example of that is that in the 30 years since Rogernomics arrived, the top 1% of income earners had their incomes grow at ten times the rate of the bottom 10%. But here’s the tactical problem with trying to change that situation. Labour has to offer a credible alternative to the policies that created and sustained that picture, but it is operating in a political climate where the current orthodoxy is seen to be the only credible one. Well, it isn’t. It hasn’t even served its own masters. And you break out of it by offering a credible and creative alternative. Which is what we will be doing. My point is that the ‘credible alternative’ isn’t seen to be credible because it is an alternative – to the old time religion that we saw celebrated again recently at the Act Party conference, and into which New Zealand still appears to be locked. I’m an optimist. In conversations with even some of New Zealand’s top business people who run multimillion dollar corporations, they well understand that this country is not maximising the prosperity of its people. Neo-liberalism is dying. It hasn’t yet been buried everywhere, but it is dying. As you say, other countries are trying to fashion alternatives that will replace it. For years, centre left parties have carried the political millstone of the tax and spend policies of redistribution. Instead, Ed Milliband has been focussing on what he calls the policies of pre-distribution, whereby governments invest in ways that prevent poverty from emerging in the first place. Here, the Living Wage campaign and the Head Start policy would both qualify as pre-distribution policies. Are we likely to see more of this kind of thing from Labour? So you’re saying – when it comes to investing in communities – that the argument is not simply on moral grounds, or because its socially beneficial, but that it is also more economically efficient to do so? Yes, it is. The Wilkinson and Pickett evidence in The Spirit Level pulled together a lot of useful data that showed that in more equal societies do better economically. And conversely – and unless it is extreme – investment by government doesn’t inhibit growth ? No. It should stimulate it, if it’s done half well. Here’s the big picture. We are a small, smart country at the end of the planet. We are never going to be able to compete with the Pearl River Delta – or India – for low labour costs. Nor should we try. Why should we want to try? What we should want to do is grow the world’s very best food, the world’s best natural products, some of the world’s smartest software and creative design, smart manufacturing and services, while participating to our advantage in global value chains. And [thereby] earning an income that will support the kind of Nordic social democracy that New Zealanders yearn for. The sticking point with the Living Wage proposal is its affordability for employers. Does the state have a role in enabling employers to make that commitment ? Yes, to an extent. What we are making clear is that we will first lead that change within the core state sector, and we will roll it out as can afford to. It is not going to be compulsory. We are going to incentivise it. Living Wage employers will get some kind of advantage in government procurement. That is something we can do. At least not penalise them by giving contracts to the low-cost providers that pay their workers peanuts. Presuming it could be properly targeted, is there any room for tax relief for Living Wage employers ? We are looking at ways of targeting the tax system to support high value economic growth. It is not currently our plan to target the tax system at Living Wage relief. That’s just not true. In fact the reverse applies. The $5,000 tax free zone…one of the reasons we knocked it on the head was that it is an incredibly expensive way of giving people $10 a week each. That was always the criticism that you end up giving $10 a week to people who don’t need it. Here, we are giving $60 a week per child in the first year, yeah… to almost everybody, within the family income threshold of $150,000. But that’s reflecting the fact that most people pay their tax, and it is never easy to have a baby. But over the next two years, it is targeted to families – full rate – with a family income of $50,000. There’s a universal entitlement to free early education, but that’s because we want every child getting pre-school. And people who earn more will pay more tax under a Labour-led government. Globally, concerns are being expressed about what is called the “Deep State” – the group of law enforcement and intelligence agencies whose domestic operations and international links to brother agencies are all but immune to oversight and control by Parliament, let alone by the public. What will Labour be doing to correct the balance between the Deep State, and elected representatives – to make it more accountable? Just yesterday, I announced our proposal for a digital Bill of Rights. Which is based on the principle that people should enjoy the same rights and privileges in cyberspace as they do in physical space. That will include the right to be free from the fear of blanket surveillance from our agencies at all times. It means that under a Labour led government we will repeal and replace the GCSB Act with one that means that – under no circumstances – in which a New Zealand citizen will be intercepted and phone-tapped without a judge’s warrant. No time, no way, no how. Let me throw back at you the argument [made by] Jim Veitch – who is a respected professor at Victoria University. But it was one of the dumbest arguments that I’ve ever heard. Which was that we needed the last GCSB law updated to quote ‘catch up’ with technology. Well I’m sorry, spy agencies exist only under the auspices of the democratic state, and the rule of law is a pre-condition, not a post-condition for whatever activities they may technically be capable of. We’re being pretty specific about this stuff. It’s not airy-fairy nonsense. We’re saying there won’t be intercepts without a warrant. Regardless of our 5 Eyes commitments, and what they entail? Regardless of our 5 Eyes commitments. Now, we can’t necessarily prevent activities – and the Director-General of the GCSB has said this in public hearings of the Security Intelligence Committee, so I’m not saying anything that hasn’t been put on the public record by the security agencies themselves – the difficulty occurs with extra-territorial applications. Yes, or when a New Zealander is talking to a New Zealander through an email system that’s based on a server located in the United States. And at that point, somebody might interrogate the server and call it domestic activity within that country. Or in any other country, by the way. I’m not picking on our American friends here… the server could be in Ouagadougou or Fiji. Nor am I saying there isn’t a legitimate role for intelligence agencies, including cyber-intelligence. We need to be able to defend ourselves against the attacks of others – and that it is a legitimate duty the state owes to its citizens. However, we do not surveil our own citizens without probable cause and a judicial process, fullstop. Coming down from that level, is there a political opportunity for Labour via this Bill of Rights or whatever to offer better policy on information sharing? I’m talking about people power in the process of government, patient power in the health system, parent power in the classroom. Should these be part of the digital dividend? Absolutely. When I was Health Minister, one of the things that used to most frustrate me in the health IT sector was that everyone had these new, beaut projects going on around ther country, but it seemed to me to be a pre-condition that health information should follow the patient – between providers, between DHBs. And if only they had one set of protocols they could actually talk to each other, and we could iron a lot of the rough edges out of the health system. Plus there would be a lot of cost savings. So that is a priority. Now, whenever you do improve the ability to move information around, you up the risk of information ending up in the wrong place. The security protocols – the care that must be taken – have to be increased commensurate with the possibilities. We’ve got ten minutes. I haven’t asked about your welfare policy, so I’ll make it specific. We all oppose fraud. Does Labour oppose the government’s new welfare fraud policy whereby the partners of welfare fraudsters will be criminally liable for the fraud, and for the repayment of the entire amount – and not simply for the amount from which they might have indirectly benefitted. If re-elected will Labour retain this provision or scrap it ? Some would say the behaviour of companies and the market is a bit like the weather – you can’t, and you shouldn’t, try to control it. Others, as I mentioned earlier, say that government’s role at times, is to save capitalism from itself. Is this why electricity markets need to be re-regulated? Yeah, we haven’t approached this from an ideological point of view. We’ve approached it from a pragmatic one. I personally watched – since I chaired the Commerce select committee in 2001 when we did the Electricity Bill – successive attempts by successive governments to iron out some of the problems in the New Zealand electricity market. And when Stanford University told us that there was nearly a 20 % monopoly margin at the gentailer level, we had a serious another look at it. And there a range of issues when there’s a reliance on the spot market. The first is, generators and retailers are so internally hedged with contracts that don’t trade through the spot market that at times it can be very, very thin or very, very volatile. Secondly, because the spot prices are allocated to ALL providers all along the cost curve at the same level, you’re often paying more for low cost hydro than you need to, or is economically efficient. And around the world, if you can’t make the traded market model work, the next best thing is a single buyer – provided you take care that it doesn’t become too gold-plated. We would take such care. It is a useful political weapon for Labour to have in its quiver, isn’t it – as the public heads into the season of high energy prices? People are getting their letters from their electricity providers this week and last week, telling them that their power prices are going up by four, six and eight per cent again this year. And it’s outrageous. There is enough capacity in the market. But here’s the problem for Labour. Key is saying that the rise in residential power prices on his watch has been far, far less – a fraction – of what it was over the term of the Clark government. Well, the problem here was the Bradford reforms which actually preceded the Clark government. and which resulted in an open-jawing of industrial vs residential prices. So residential prices climbed steeply, and industrial prices after inflation remained about flat. So those who didn’t have the buying power ended up getting it in the neck and those are the people we’re here to represent. We make no bones about going for fairer electricity prices that will lower the cost of living for hard-pressed Kiwi families and for our most vulnerable, like our elderly – and my God if I go into another pensioner flat in winter and see an elderly person wrapped up in an eiderdown in a cold draughty flat because they can’t afford to put the power on, I will scream. From what you just said… Are you saying that the relative impotence of the Clark government on this point, was entirely due to it being captive to the Bradford reforms? And that is something that only now, you, David Cunliffe, are going to address? Firstly, politics is a team game and I’m here speaking about Labour policy and not just my own predelictions. Secondly, I wouldn’t put it the way you put it. I said that we spent years and years and years trying to get an inherited Bradford model to work. By the end of the Clark government it was clear to my generation – people like David Parker and myself, and true of Shane Jones and others as well – that the model at hand was inherently volatile and inefficient. And therefore we ought to give due consideration to what the next best alternative was. And around the world that’s single buyer. You’ve got to bring it in carefully. We’re not going to argue with that. There will be a consultative process. And you’ve got to make sure it doesn’t get too heavy. Not gold-plated. We understand that. And it has every chance of lowering prices to Kiwi families. That’s what we will try and do. And the fact that Key can claim – whatever his sins – the rise in residential prices was higher under Labour? What about that ? That’s… that’s a bit of trickery. Because what Mr Key has now done – if he possibly can – is he has sold off half the three remaining gentailers. And that is going to create an incentive for those power prices to rise even quicker. So New Zealanders should be doubly concerned: firstly that the family silver has been sold down, without any long term plan for structural growth. And secondly, that they’re going to end up transferring more of their hard-earned housekeeping into the pockets of foreign bankers and fund managers. because Mr Key, for some strange reason. sees it as an ideological priority. To wrap this up – is the middle class now an endangered species in this country? What the numbers tell us is that the top ten per cent have done well, the top one per cent especially well. The middle 30 or so per cent have trod water and the bottom 40 percent have gone backwards, in real terms. And the most vulnerable, the worst. I don’t want to live in a country where my kids are growing up in a country with a few people in, you know, opulent circumstances, and too many people below the poverty line. And it’s got to the point where it is unacceptable… and we are going to fix it not with a magic wand but with a sustained programme of high value economic development, fair industrial relations laws, a caring state and opportunities for all. It will be a historic project … and it will be a big change from the neo-liberal muddle through that seems to be the best that the grandson of Keith Holyoake can manage. The question is whether Labour can seem like a convincing alternative, in a time of 4-5 % growth. Even if pay rates start to catch up, the dysfunction in our economy seems to be structural and permanent: insecure jobs, insecure housing, middle earners (and others) concerned for their children, graduates facing huge debts and low paying jobs. If your call for change is so timely, why aren’t these people already flocking to Labour ? Well, more of them have than has been the case since the last time we were in power. Labour’s membership has more than doubled in the last 12 months. We’ve had thousands of young people just join us in an online campaign called “I’m In.” So there are strong signs of resonance with the electorate. But we don’t under-estimate the difficulty of the challenge… We’re up against it. We’re up against a powerful state. A Prime Minister who has worn those shoes for five years, and a whole lot of vested interests that are giving more money than God to our opponents. Against that, we have policies that work. We’ve got values that matter. We’ve got principles that will lead to a better and fairer New Zealand. 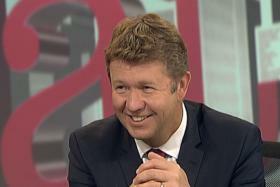 If Labour does lose this election, would David Cunliffe be inclined to say goodbye to politics ? So this is your best shot, but not necessarily your last shot ? I’m here to help New Zealanders get a better future. 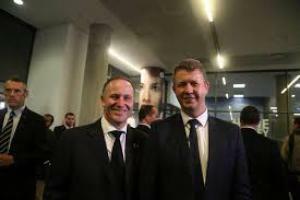 I’m putting my neck on the line, to achieve that outcome for Kiwis.